I didn’t mean to keep you all in suspense for so long over my word for 2019! I just didn’t want to tell you what it was without also giving you the full backstory on it and explaining what it means to me and how I plan to walk it out. At first glance, the word I chose might come across as seeming out of character for where my heart is and might not feel like it’s in alignment with things I’ve written here recently. But hang with me, because I hope that this post will help explain my why behind choosing this word and how it will be driving my year. Here’s the funny thing: I randomly picked up this book called Chasing Excellence from a search on Amazon. I didn’t even know who Ben Bergeron was when I bought the book. I just was so inspired by watching the athletes at the CrossFit Games that I went on Amazon and searched for, “CrossFit athletes”. It pulled up Tia-Clair Toomey’s book and then Chasing Excellence was recommended, too. 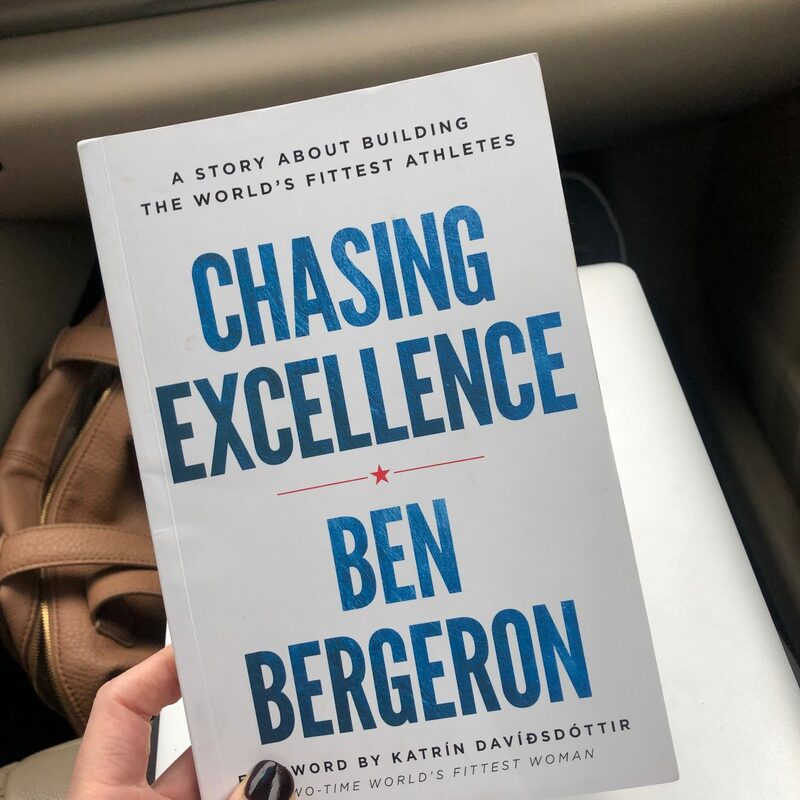 It’s rare that Amazon steers me really wrongly, so when I read the premise for Chasing Excellence and thought it sounded intriguing and worth reading, I bought the book. Little did I know that this book was going to become the basis for my word for 2019! This book was one of those that you wanted to read both quickly and slowly. Quickly, because you wanted to gobble it all up as it was so good. Slowly, because you wanted to savor it as it was so good and you didn’t want it to end. 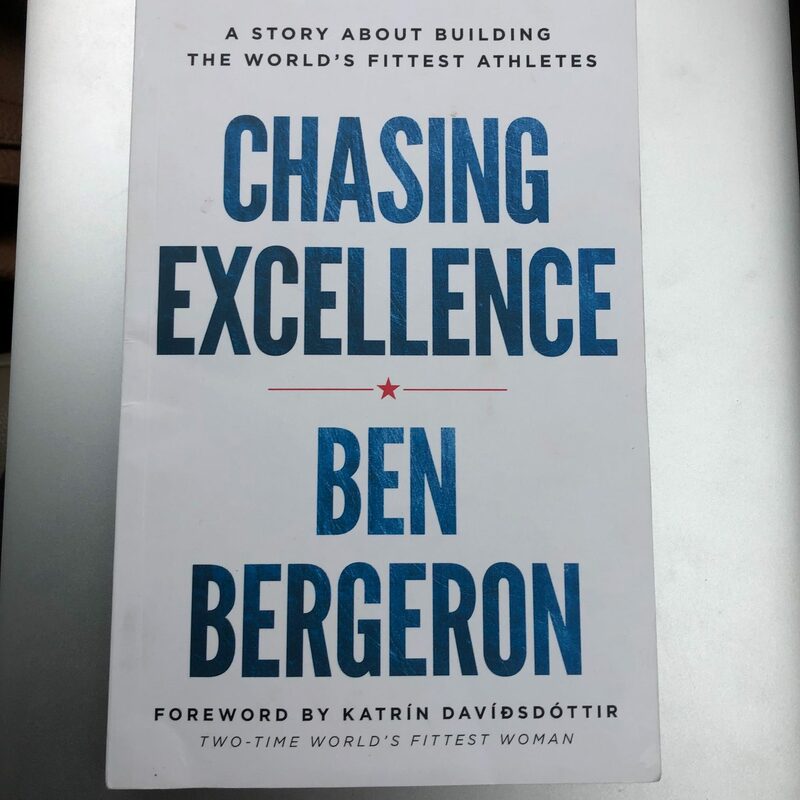 For those who are unfamiliar with the author like I was, Ben Bergeron, is a coach to some of the world’s most well known CrossFit athletes. If you love CrossFit, you must read this book. But even if you don’t care a tiny bit about CrossFit, this book is packed with nuggets of truth and inspiration. The entire time I was reading Chasing Excellence, I was so inspired and moved and challenged. And instinctively, I knew I wanted to pick the word EXCELLENCE for 2019. But it also scared me a lot. Wouldn’t this go against everything I had been learning and growing in? Wasn’t my heart’s desire to continue to work on savoring life, not living life at breakneck speed, and not feeling like I needed to hustle and climb a ladder to success? And yet, I couldn’t get this word out of my mind and heart. So I took September and October to mull over it. I realized there were many areas in my life where I was settling for mediocrity. I wasn’t intentionally pursuing excellence; I was just doing what I’d done for a long time because it was getting me by. I had gotten stuck in a lot of ruts. They weren’t terrible ruts; but they were ruts and I wasn’t seeing a lot of forward momentum. I also wasn’t feeling super excited and motivated in many parts of my life — especially as a business owner, in some of my personal disciplines and habits, and when it came to growing as a person. Yes, I wasn’t failing (in most areas). Yes, I was doing a decent job (in most areas). But do I want to just do a decent job at life? Or do I want to pursue excellence? Y’all, I want to pursue excellence. And so, it was decided: My word for 2019 is EXCELLENCE. And I’m really excited about it! My heart’s desire is to be much more intentional in how I invest my time and how I structure my life so that I am not just coasting through, but that I’m truly seeking to live with excellence in those few areas that matter most to me. And on the flip side, I’m good with letting most everything else that’s not on my priority list go for this season of my life. Because I can only do a few things with excellence. 1. I want to pursue excellence in my relationship with the Lord. I don’t need to be more or do more to earn God’s love for me. I know that I am loved immensely by Him. It’s because of this, that I want to spend more time deepening my relationship with Christ. In 2018, I didn’t spend as much focused time intentionally investing in my spiritual walk and relationship with the Lord. I read my Bible and I prayed, but it was often sort of squeezed into my morning instead of being a top priority. In 2019, I’m committing to begin my days with time in God’s Word, time reading a good devotional (I’m reading Streams in the Desert and the Daily Light), and time in prayer. I want to start my day on a foundation of excellence. 2. I want to pursue excellence in my marriage. I’m blessed to be married to a great man who loves me selflessly. We have our struggles and our fights and our disagreements, but we are both incredibly committed to each other. However, I know that it’s easy for me to take Jesse for granted and to let other things take priority. I am committed to making one-on-one time with Jesse a priority for every day in 2019. 3. I want to pursue excellence in my personal life. I’ve gotten a little lax in recent months when it comes to consistency in my personal life. I haven’t been going to bed early enough. I haven’t been eating as healthfully. I haven’t been spending as much time reading as I would like to (mostly because I was distracted by “shiny things” on my phone — like Instagram!). And I’ve not been doing enough offline things that were really life-giving to me. This year, I want to get back to better habits personally that will serve my soul and nourish my body so that I can live with excellence in my other priority areas. 4. I want to pursue excellence in my mothering. As I’ve alluded to recently, 2018 was the year I really woke up to the fact that my mothering clock is ticking away and my kids won’t be living here for that much longer. I’m excited to get to “launch” our kids into the world, but I also want to make the most of the short years we have left together. I want to use these next 5-10 years well — spending time together, nurturing our relationships, teaching good habits and life skills, and pouring love into these three precious kids. 5. I want to pursue excellence in my business. Last year, I had some rough patches business-wise. I felt like I spent at least 3-4 months of the year in survival mode as a business owner. Much of this was due to a number of things that were outside my control. But some of it was due to me not compartmentalizing business and personal life well and not having clear-cut objectives and plans for many parts of the business. I felt like I was just along for the ride and barely hanging on sometimes. I spent the last 6 weeks really asking myself where I succeeded, where I failed, and what needed to change. And I’ve made some pretty big adjustments as a result. 6. I want to pursue excellence in relationships. I did a great job in this area in 2018 and I want to continue this in 2019 as it the stuff that real living is built on. I am committed to continue to open up our home and be very proactive about investing in people and going deep in friendships and building into local community in 2019. So there you have it! I feel so excited and motivated by this word I’ve chosen and what it means to me and how I plan to walk it out. And I hope that my heart behind it comes through in this post. Excellence, for me, is not about doing more or pushing myself in a way that is unhealthy; it’s about pursuing excellence that is life-giving and life-changing — for myself and for those closest to me. One way that I’m seeking to stay accountable is through a daily habit checklist. If you saw my checklist that I shared in an earlier post, I actually ended up adding a few extra things to it: namely, 40 minutes of one-on-one time with Jesse, Kathrynne, Kaitlynn, and Silas every day. I know that I won’t always hit that goal every day (or any do any habit on my list perfectly!). But my hope is to aim to check 5 boxes in each line of my checklist every week. Some of you might feel like a checklist seems over-bearing or not grace-filled or something that could cause stress. For my personality, it’s actually motivating. It helps remind me of my pre-determined priorities, it keeps me on track, and it serves as a sort of built-in course corrector. Plus, if I find that I’m feeling exhausted or stressed or discouraged, a quick glance at the list might provide some clues as to why — maybe I’m not getting enough sleep or I’m not spending enough time offline or I’m not investing in life-giving things, etc. So far, the checklist has been so helpful and I’m excited to see how it works as the year progresses. I’ll definitely keep you posted! 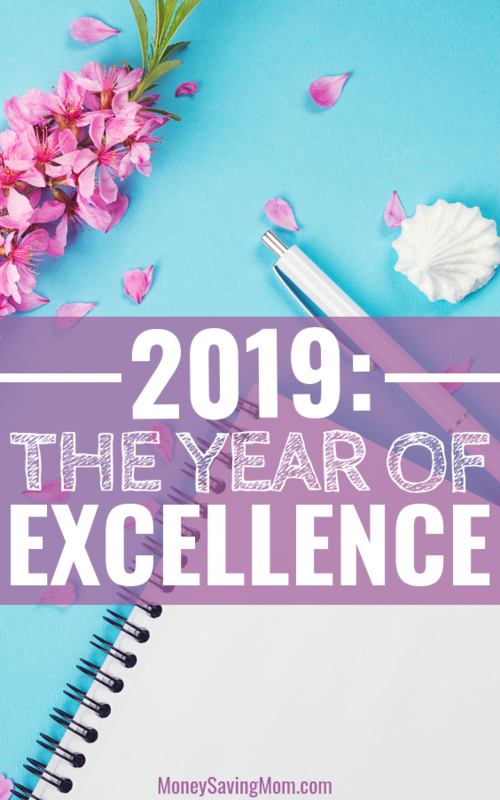 Here’s to a year of Excellence in 2019! 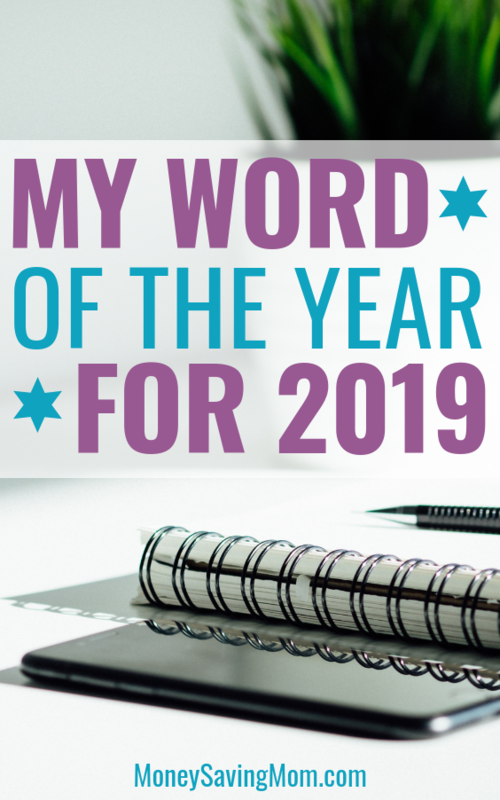 Did you choose a word for 2019? If so, I’d love to hear what it is, why you chose it, and how you plan to walk it out. Love the checklist idea. My word for this year is, Intentional. The checkbox idea I think will help keep me on track and motivated to continue to be more intentional about the things that matter. I love your word, Excellence and loved even more that you were so intentional and prayerful about picking it. Thanks for being such an inspiration. Thank you so much for your kind words of encouragement! That’s my word too! Last year was a year of survival when my husband lost his job and the free housing that went with it. We had to move across the US to live with family until we could get on our feet. I let a lot go but this year I’m going to be Intentional! Nicole, seems like it was rough year last year. Wishing you a happy 2019 and a year of intentional living. 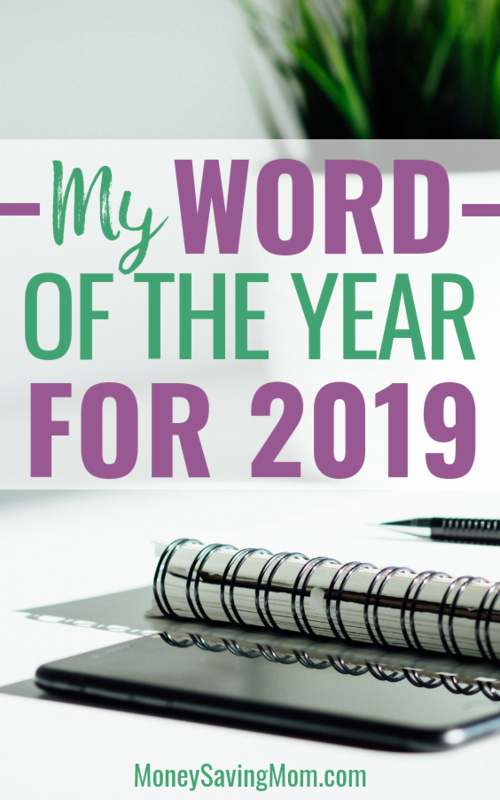 My 2017 word was celebrate and my 2018 word was restore…2019’s word is sanctify. I feel I am in a great place in my routines and life and now I want to see everything through a lens of what will draw me closer to God. I want to siphon through all the details of my life and make sure they point me, and others, to God and if not, I want them to go. I want to spend a year (and hopefully a lifetime!) focusing on what God wants for my life. It won’t be perfect, but I hope when 202 rolls around my life feels more aligned to God’s path for my days and not so focused on my goals and ideas. I LOVE excellence for you word! Did NOT see that coming! I love your words you’ve chosen for each year! Thank you for sharing! I’m a little confused on the 40 min one-on-one time. Are you saying 40 min 1 on 1 everyday with all 4 of your family members? Or are you saying each kid gets 40 min of 1 on 1 time every week? Or every day? Sorry, I wasn’t quite clear and this is an area I’m specifically looking to make a priority this year. 40 minutes with each child/Jesse every day is what the goal is — but I know that won’t necessarily happen every day. The plan is for Jesse and I to have time together in the mornings after the kids go to school — before my work day starts. And then I have time with the kids every evening we’re home — Silas is from 6:40-7:20, Kaitlynn is from 7:20 to 8, and Kathrynne is from 8 to 8:40. Thank you for explaining. It’s a worthy commitment that can quickly add up to lots of time, memories and impact. I chose the word RENEW for many of the same reasons you chose excellence. I’m an empty nester and feel like I’ve stagnated in a lot of areas the past few years. I want to renew my body by exercising regularly, renew relationships with friends by pursuing friendship, renew my marriage by planning more fun activities with my husband and renew my home by decluttering and simplifying. Love your word of the year and your reasons behind it! I’m getting together with some ladies from church next week to think of our word and I’ve no idea what to choose! Thank you so much for posts like these. I’m in the same boat, only 5-10 more years with my 3 kiddos. I love that you are getting together with some other women to discuss this! What a great idea! I love your word of the year! My word for this year is adventure! I want to try new things even if it means coming out of my comfort zone. I want to be more spontaneous with myself, husband and kids and just have fun! Maybe even a fun trip somewhere! I LOVE your word choice! I think it’s totally okay to have some years where you just keep it really simple and quiet when it comes to goals. Maybe that’s what your heart really needs most? Love this! I am married to a man who is unmotivated and not goal oriented. I am really struggling with how to get him to make positive changes in his health and life as well as how to be okay and love him anyway if he doesn’t try to grow and improve. I know you and Jesse are both so driven so maybe you’re not sure as this is not something you’ve experienced but I am frustrated and don’t know where to find direction on this. Jesse was really unmotivated and honestly lazy in many areas when we got married (he’s okay with me sharing this because he wholeheartedly agrees!). I tried so hard to change him and that just led to frustration and stress in our marriage. Instead, I committed to just love him and praise him and pour into him. I do speak honestly to him if he asks for it or asks for my input, but otherwise, I got out of the way and just focused on my own self and working on me. And he’s a completely different man today than the man I married… and I think it really has to do with the fact that I stopped nitpicking and being frustrated and wanting him to change and started loving him for exactly who he already was. Wow amazing advice!!! I learned that lesson too a few years ago and you’re so right Crystal, it changed my marriage for the better. My word for 2019 is DO! I am going to get all my products out and make my business thrive, God Willing. I love the word you chose! This year, my husband and I are doing a word together. BRAVE. We both have our own goals we want to accomplish, but we also have some goals we want to accomplish together. And they are a bit scary. So, BRAVE it is! My word is PRESENT! Goal is to be more present in my time with God, my family, my personal growth and with my clients (i am a counselor). And also, allowinf myself to be more present in my rest! My word is also present. I have often found myself not really listening to people as a result of multitasking and I know this is bad for me personally and for my relationships. I am making it my priority to put down the phone, computer, or reading material when a member of my family walks into the room and begins speaking. I love that checklist idea. I was thinking about making one just the other day. My word for 2019 is Courage. I want to have the courage this year to put myself out there more for people to see the real me and then be okay if people don’t like that. Thanks for your posts. That’s such a great word! I’ve never chosen a word of the year before but can’t seem to shake that my word for 2019 needs to be “Patience”. As a mom of 3 littles (8, 4, and 2) I could use A LOT more! As well as other areas like finances, fitness, etc. patience is so hard yet I can feel God wanting to work on me there! I always want what I want now! ? Thanks for sharing your words. Always so inspirational! Patience is a fantastic focus for 2019! I have never had a word but I don’t want to be mediocre either, just drifting along. I will think about this. Can you tell me what you mean by 30 mins of something life-giving? I find your checklist so inspiring! Just something that brings me life and is refreshing to me — it could be hanging out with a friend, watching a show, quiet, listening to an audiobook, reading, etc. 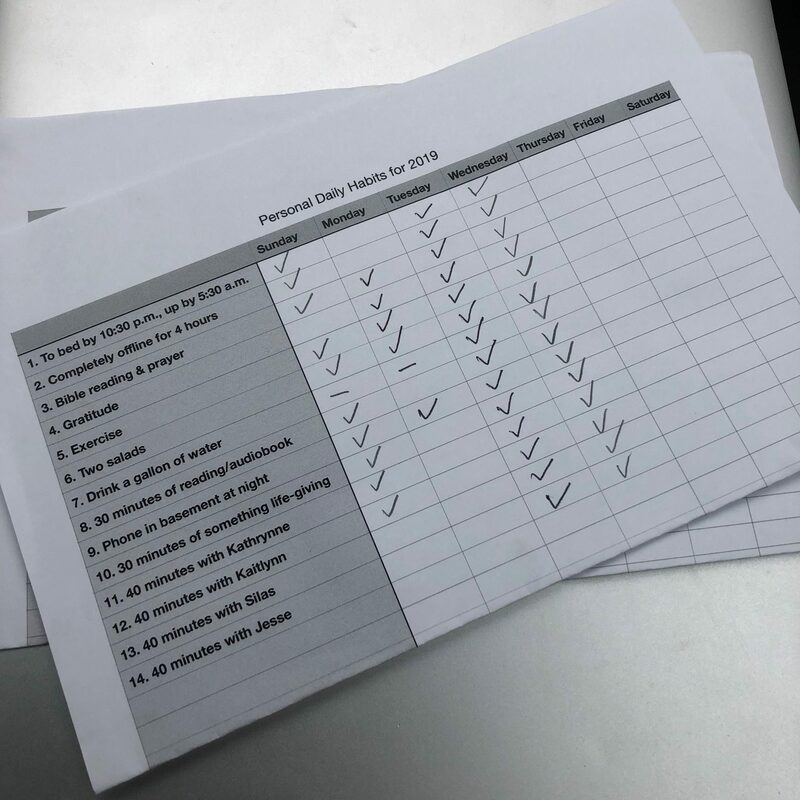 On most days, it’s going to overlap with something else on my checklist… but I put it on there just to make sure that I am doing something every day that is restful/refreshing to me! My word for this year came to me while thinking about my goals for this year…but honestly it’s been the path God has been slowly turning me towards this fall already and that word is LESS. When I was writing potential goals for the year, so many goals had that word in them! I plan on doing less of what doesn’t really matter and buying less stuff and keeping less stuff and having less screen time. I plan on complaining less and worrying less also. All these are things God has really spoken to me about. What an EXCELLENT word choice! I love it! My word for this year is available. I want to keep my mind and heart open and obedient and available for what God has planned. Oh my gosh I LOVE your word and I’m totally going to steal it for my word for 2019. 😉 Here’s to a year of excellence for us all! Happy New Year! My word for 2019 is productivity. I struggle with discipline and really wanted to see some results this year. My goal is not busyness or adding to my plate, but to maximize my effectiveness in all existing areas- with my spiritual life, my family, my home, my job, etc. I am really excited about it. I perhaps could have chosen a more precise word, but I wanted something that would move me in the right direction. When I found this definition, “the quality, state, or fact of being able to generate, create, enhance, or bring forth goods and services,” I really liked the generate, create, enhance part. I like to think of the big picture and then generate, create, and enhance to achieve it. ? I can create a warm and safe atmosphere in my home by using my time productively. I can create opportunities for strengthening relationships with my husband and children and enhance our relationships. I can go on but basically I want to make choices that help me to ensure my efforts are leading me to my end product and not just spinning my wheels or just passing the time. I could relate a lot to where your heart is and think it is very much similar to my plans for 2019. 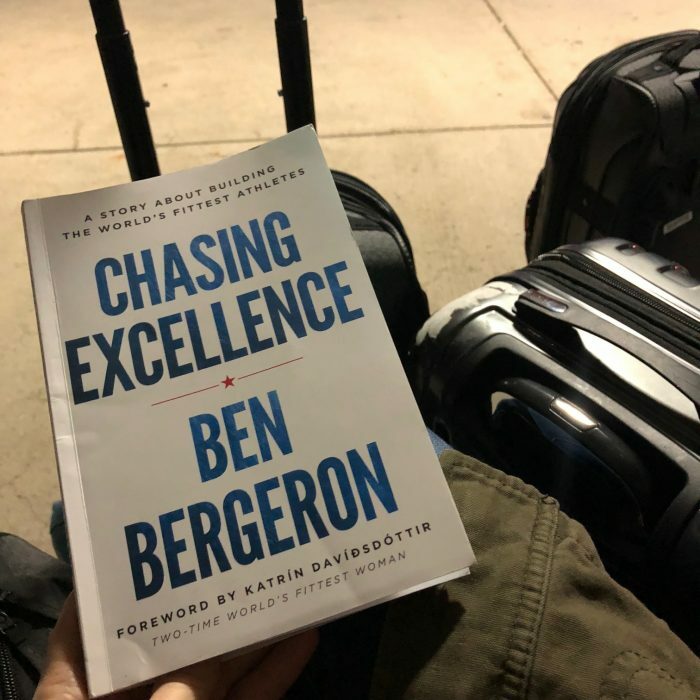 I also bought the book, Chasing Excellence, after reading your recommendation about it a while back- though I haven’t yet read mine! I think it will be the book I read to accomplish my read 1 book in January goal. I love your daily checklist and think I will incorporate something similar as well. I started a different checklist already but yours has given me some more ideas. I love lists and find them very helpful in making things seem manageable and less daunting. Thanks for sharing! I LOVE this! Thank you for sharing! And let me know what you think of the book after you read it! My word this year is cherish. As a new momma to a 2 month old, I want to cherish every moment possible with him this year. I want to cherish tine with my husband and make our relationship a priority. Teaching full time and finishing up a degree is stressful and time consuming. This year I want to cherish and enjoy every minute possible with my family. Thank you so much again! Your beginning of the year 2019 posts have been inspiring. They have changed my outlook on the new year and how I can make it a better one. I’m ready to put time into what really matters and prioritize my life. Thank you for your list of things you will be “excellent” in this year! That list is exactly what I needed to see for my word of the year as well. Thank you so much for your encouragement! And that’s a great word! Love your word of the year. I’ve been choosing a word for the last several years and this year I chose ‘mindful as my word. I want to be mindful in how I spend my time, with whom, what I eat, etc. Happy New Year and thank you for your blog, I’ve been a reader for a long time and have enjoyed it. Oh! I love that word! I LOVE the First 5 app from Proverbs 31 Ministries!! It has helped me dig into the Word book by book and find applicable things for my life today. It really takes 5-10 minutes and is pretty much self paced. Jan 14 starts the book of Proverbs. I’ve heard so many people who love this app! Since I’m keeping my phone in the basement at night and trying not to look at it until after I’ve spent time in God’s Word, I’m doing the Bible reading plan in my She Reads Truth Bible. My word of the year is really quite odd. It is Fiat. It is a decree from a position of authority. It means let it be done. As an example in Genesis 1 the latin translation is fiat lux, let there be light a powerful decree from authority. I want this year to be be different. I feel like I have had some of the same goals for many years without making progress in some areas. This year I don’t want to live the same life over again. I need action so my prayer is Fiat, Lord let it be done. The word reminds me that God has given me the strength I need to move forward. Not a word that will inspire a bracelet but powerful for me. I love the habit list!! Doing that today!! What a beautiful prayer! Thank you so much for sharing such a heartfelt comment! I very recently found your blog and followed to enjoy the great deals you have found. However, I was pleasantly surprised by the Christian notes and as I continued to read more found your attitude and spiritual reflection refreshing. Thank you for your candid self inventory and your suggestions for leading a more fulfilled Christian life in this new year! I am on the opposite end of life spectrum, retired and hundreds of miles from my siblings, children/grandchildren. I have never heard of a word for the year but today will be searching for that word for myself. Thank you so much for your kind encouragement! And WELCOME! We’re so glad to have you here! My word for 2019 may come off harsh but it’s “no”. 2018 was filled with way too many commitments that left myself and my family exhausted. Thankfully, our family of 5 all recognized our overbooked schedules (mine particularly) and knew our priorities had become out of order. So, in 2019 I’m not going to be afraid to say “No”. I, too, have created a daily checklist to keep me accountable. Thanks for sharing and being inspiring. That’s similar to what I did in 2015 when I chose the word Rest. I said no to almost everything that wasn’t a necessity for 6 months… it truly changed my life in powerful ways! This simple idea of a daily checklist is exactly what I needed!! Thank you! I love your plans for your year! I’m so glad that it inspired you! My word of the year is Passion! I want to pursue the things that matter with a passion. I want to be passionate about the things God is passionate about. My relationship with Him, my spouse, my children. I want to glorify Him in even the most mundane tasks. Instead of just rolling thru my days and to do lists..I want to see Him in all things. My husband has a vision for a ministry and I want to chase that dream with him and be his best supporter. All with our eyes on Christ…passionately. My word for the year is FOCUS. I feel like I was living a life of thinking negativity, I was introduced with 5 words “change your way of thinking” I feel like the 5 most valuable words I could have ever heard. So this year I want to continue to work harder to focus on positivity and to always lead a positive life. I don’t want to be surrounded by any form of negativity and honestly keep it out of my life whether it be personal or social networking. Here is to bigger and better things. My word is Light, meaning letting God’s light shine in the dark areas of my life. And letting His light in me shine for others. I’m both excited and anxious about this word! Love hearing everyone’s word. My teen daughter is inspired to pick her word too. She chose Represent to mean remembering that we are an ambassador of Christ and we represent Him in all we do. I chose the phrase “Be Glad” and my verse is a Psalm 118:24. I want to find joy and happiness and contentment in all aspects of my life. I want to be glad in every day. My word for the year is GRACE! I want to be able to look past the “stuff” in other peoples lives and show them love regardless. Be extra kind and thoughtful and really just live out the grace of God. I also want to accept I’m not a perfect wife, mother, friend, etc and sometime my house isn’t clean or I pick up fast food and it’s ok. I need to give my self grace and look past all my stuff too. But most importantly I want to fully accept Gods grace for me…that through all my shortcomings he has given me his love (grace). What a great word! We need a lot more grace in the world! Hi Heather! I never “pick” my word, but pray for it, and God gave me the word GRACE for 2011. It was an incredible year, and then as I began praying over 2012, I was (very surprisingly) gifted GRACE again! I learned SO much during those two years! May you have an incredible journey this year! I am so excited for you! Blessings! Thank you! When I prayed about my word grace kept coming up and quite honestly I didn’t want that word. I even tried to say God have me a different word but I wasn’t settled. Once I said ok God you gave me grace as my word and areas of my life to work on I had the most peaceful feeling. I’m excited to see what God had in store for me. Blessings to you as well! Hi Crystal, I like the spreadsheet you made to track your goals. Is it possible to get an editable copy of that? I’m not sure how to provide an editable copy, but I created it in Numbers on my computer. You could also do it in Excel. It literally took me just a few minutes to do! I am choosing my word on Jan. 13. We have an event and church to “work on” choosing our word along with bible journaling. Love yours! I love that your church is doing this! INVEST. I too was blindsided by my word. It was nothing I was considering or dwelling on. I’m still processing it to be sure it is in fact my word for 2019, but I actually am very excited about it! Investing in the obvious ways (financial, health, etc. ), but also in friendships, our marriage, funding IVF for our infertility struggle, extended family, household systems, solutions that make life much easier, etc. Outlaying time, money, love, energy in a significant quantity to encourage future success. Also, we have a brand-new puppy, so we need to invest in her health and training to raise a well-behaved dog. What a great word! Thank you for sharing! I’ve been mulling this over lately and it finally came to me, so I feel the need to type it out immediately and make it real. 2016 I slowed down with my third pregnancy. 2018 I had a very difficult 4th pregnancy (severe spd, wheel chair crutches, major pain) She’s just 2 weeks old now. Our final baby. My word. Refocus. These last years I haven’t been able to do the things I’d like to. I’m ok with it as life happens, but it’s time to refocus. Cooking, cleaning, organizing, relationships, outside work/projects…. It’s not time to add or explore new, but rather time to get back to my goals and work. So once we finish resting and healing I want to spend this year refocusing on living intentionally and being productive again. Mine is Faith – I want to try and develop a Christain faith. Any book suggestions? I have been listening to Emily P Freeman’s podcasts and I just love them. I want to, also have more faith in people, my marriage and my life in general. I feel careworn and frustrated at the moment. My encouragement would be to find a great church to attend and to get involved in, if possible. Thank you so much for sharing! I love your word you chose! I would suggest reading the Bible from cover to cover. Don’t worry about studying it, but just read it like any other book. If questions come to mind, just keep a log of them to revisit after you’ve read through it once. I wish I had read it sooner. I sat in a pew for decades before I did. My word is Wholehearted. I’m not sure exactly what 2019 holds for us (a lot is up in the air right now), but I know I want to attack the coming year with my whole heart. I love the idea of habit tracking. I may have to borrow that idea. This is very ironic! I decided, upon the leading of the Lord, to make “excellence” by 2019 focus word after seeing you mention the “chasing excellence” book a few month ago. I listened to the audiobook version in 2 days. It was THAT good to me. I concluded that I’ve accepted mediocrity in my life for too long. Thus, 2019 is the year that I will pursue excellence in every area of my life. I believe that pursuing excellence is saying yes to myself. Wow Crystal, this post relates so much to my own life as well! I share part of your priorities, and I love the way you clarify your intentions so profoundly and practically. My word for 2019 is brilliance: to cast a light in our life and the people around us, bring our inner light out and let it shine I everything we do. I love your word! Thank you for sharing! My word for 2019 is TRANSFORM. This has been an exciting yet exhausting year for us. My daughter and I gutted, remodeled, staged and sold a 133 yr old house, gutted and remodeled a house for my son and his new bride (they married in July and I did almost everything for the wedding, including flowers for rehearsal dinner, wedding and reception! ), helped my daughter design and build her new home (which she just moved into 3 days ago) and became an empty nester. Oh and I became post-menopausal sometime in between (not fun!) Because of this my body, my home and my marriage were put on the back burner and it shows. I led a Bible study this fall titled All Things New which talks about transformation and God kept whispering to my soul telling me He can help me to transform these areas of my life if I’ll just focus and work on them and trust Him for the help I’ll need. It’s not going to be easy but I need to do something for my sanity, self- love and to keep my marriage strong in this new season of life. After transforming so many things outside of my home and myself, it’s time to focus on myself, my home and my husband. I’m looking forward to starting 2020 having fulfilled this goal. Thanks so much for your post. I love your word of the year! I’m sorry that it was such an exhausting year for you, but I love the word you chose for 2019! I think excellence is a great word. We should always work to do things with excellence, not to be confused with perfection. I’ve never been the perfectionist type, but I’ve also never been the type to do things with excellence. I’ve often settled for mediocre. The last few years, God has shown me that He wants more for me, and doing things with excellence means doing it the best that I can with His help. My word for this year is healthy. I’m focusing a lot on physical health, but also health in relationships, mental health, emotional health, and spiritual health. YES! This is so good! Thank you for sharing! EXCELLENCE is the word I chose too! Love it! It was a word I wasn’t even considering but when I was mulling over my big goals for the year and I realized that I had allowed mediocrity to creep in. Just doing it without giving it my all. WOOHOO!! Here’s to an excellent year! I was struggling as nothing was sticking as I prayed and thought. Words that had come into my mind were Enough (I have enough, I am enough, living from a positive place of enough rather than always trying to get/have more), Declutter (my mind, my schedule, our house), and a few others. I was talking with my therapist about it and mentioned that one thing I really feel like I need to do in 2019 (as HARD as it is and as much as I dislike it) is learn to sit with being uncomfortable (in addition to all of the above). Not indefinitely of course but I’m a fixer and I’m really, really good at solving things. But sometimes if you ‘solve’ things too quickly you make decisions that aren’t the best or you miss out on the lessons you are supposed to learn. My therapist said offhandedly, it sounds like you need space. And there’s my word for the year. Space. Making space for what is important and removing everything else. Oh! I LOVE the word SPACE! I might steal that for an upcoming year sometime! My words for the past three years have been peace, joy, and last year grace. I am retired now and finding a new normal for my days. I read a blog post about “a year of gentle domesticity” and decided that gentle will be my word for 2019. It’s okay to be pursuing quiet pastimes and focusing on my home for this season of my life. To me, “gentle” feels calm and restful. My word for the year is Wholehearted. I feel like God led me to this word, but I’m not sure yet what He wants me to do with it and what goals I need to set that relate to it. I have never done a word for the year before. This year I’ve decided on CHOICE. In working with my mental health I’ve really tried to change my perspective. I have the choice to make decisions that align with my values instead of going along with patterns that I developed because of a traumatic past. Each decision is choice. I love your word, habits and blog posts! I look forward to checking out Chasing Excellence. I’ve been doing work to uncover my vision of an exceptional life lately, and yhe book looks like a timely read. I have been reading your blog for a few years now. Thank you for the courage to candidly sharing your journey. Cheers to EXCELLENCE in 2019! Highly recommend “New Morning Mercies” by Paul David Tripp for a devotional if you are looking for one after you’re finished with your current devotionals. So rich and full of Gospel truth that will cause you to reexamine your thoughts, relationships, priorities in light of God’s amazing, amazing grace! As I was praying and writing out my goals for the year it became very clear to me my word for the year is INTENTIONAL. Intentional in my relationship with God, my marriage, my parenting, my health/sanity, and relationships outside my house (this last one terrifies me!). My word for 2019 is PURPOSE. Living with a purpose really spoke to me. Living life with a purpose is much more challenging. Without purpose, what is the point? Actually, we all have the same thing in common. Setting goals and attempting to complete them for our own purposes. Not in a selfish way, but a meaningful way. Health. We are ery healthy in this family (knock wood), but I want to be more strong fit (physical health), rein in the debt and elminiat unnecessary expenses (financial health), and clear my mind to be the best mother I can (emotional health). The last part of your post starting with the paragraph of “settling for mediocrity” down to where you begin your list of areas of excellence is something I could have written. I have felt the same way for a long time now. You put words to my feelings/thoughts/frustrations that I’ve not been able to. I love the word excellance but my word this year is RESTORE. To return to its original condition. Even though only God can do this in me I have to cooperate AND participate. This year will be about me doing just that. Thank you for all you do. You won’t know until the end just how many people you’ve positively impacted and in what ways you’ve done so. God bless! Thank you so much for your kind words of encouragement! I’m so grateful it inspired you! My word is “Me.” Focusing on taking time to take care of myself (exercise, relaxing, time with friends, etc.) I was going back and forth about it and told me husband that I felt guilty making it about “me” and he reminded me that that’s exactly why I need it. So there it is- 2019 is all about me! My word this year is Emmanuel. That’s a little odd, I know, but I realized during the holidays that there is little as powerful as “God with us,” so why not make my word be a 365-day reminder of that? After all, embracing that idea changes everything – and I’m ready for some God-guided change! My word is similar to some of the others listed here, but your post really hit home with me and the word I chose. My word for 2019 is purposefully. I want to live this year purposefully,especially with respect to how I spend my time, my finances, my talent. I want to make sure I am living the way God wants me to and and purposeful in the things I do. I don’t want to procrastinate anymore or live like I am always trying to catch up. We had a major health scare with my Mom at the beginning of 2018 and quite honestly since then I felt like I have been running to catch up with things all the while trying to spend more time with family and make the most of life. I think this word suits what I want to accomplish this year and I thank you for sharing your word and what it means to you. I am always grateful to you when I read you posts that you are willing to be honest and truthful with your readers. Here is my blog post on it!! I’d love for you to read it. I’m such a fan of yours Crystal!! Thank you so much for sharing! I LOVE the word that you chose!